PARKS AND TRAILS: LET'S GO PLAY! 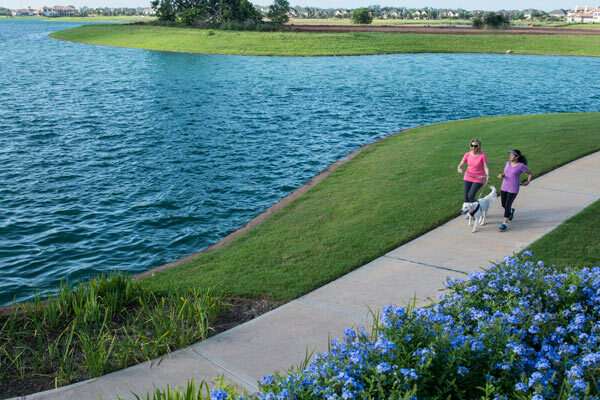 Parks are interspersed throughout the Riverstone landscape, offering residents a chance to enjoy the Texas sunshine in picturesque surroundings. Many of the parks feature play structures where neighborhood children can slide, climb and swing as parents watch and visit. Other areas feature seating amid garden spaces and along waterways, giving residents a chance to watch the wildlife and enjoy a sunset. There even is a park devoted to canine family members, a 3.5-acre space where dogs can romp leash-free. 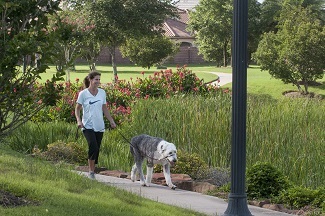 Connecting the parks and neighborhoods is a series of trails through the community. Riverstone will have more than 20 miles of trails upon completion, creating a pedestrian-friendly environment for active-minded residents.